Once again I have failed in my commitment to regularly post a blog on this website. However I have managed to regularly post progress shots of all our projects on my social media accounts. AND, have been knee deep in the practical and design side of the projects. BUT most importantly, a lot of energy has been dedicated the job of mothering my two little monkeys! 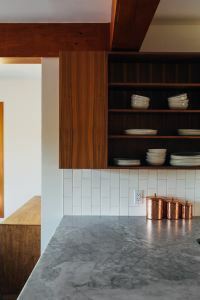 Whenever and wherever possible, drawers rather than cupboards when it comes to below bench cabinets is the key. The primary reason for this kitchen must have is storage. I know from personal experience how frustrating a shelf can be compared to a drawer. Especially when you have a dish at the back of a cabinet, on a shelf which requires all the items sitting in front and on top to be lifted out before I can access it. A drawer eliminates this issue, allowing you to access items at the back with ease. Make sure you think about drawer depths as well. You’re going to need some shallow ones for cutlery, utensils ect, but you’re also going to need some deeper ones for pots. Make sure you have the right ratio. I usually make sure there are at least 4 shallow drawers (ideally 600mm-800mm wide), and make the remainder deeper for larger pots, pans and bowls, etc. Might sound like a rubbish suggestion (pardon the pun! 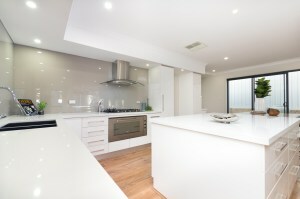 ), but this can often be forgotten when kitchen layout is occurring. 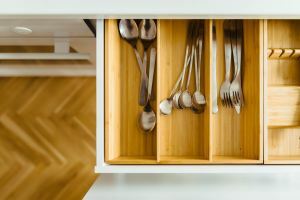 There is a bit of a science to getting the dishwasher-sink-trash location combination right, and it needs to be thought our thoroughly to ensure practicality. Many people forget to include a decent space for a bin and end up with either a tiny container under the sink that needs emptying CONSTANTLY. Or they have to invest in a free standing trash can, and as a result, needing to find a spot for it to sit without blocking traffic flow. I personally think this is a definite kitchen must have. Especially if you have little ones. Having a safe location for glassware that is out of reach from the youngest family members is something to consider. Plus you have a range of options (depending on layout and style). Anything from open shelves to overhead cupboards with clear glass doors which can display some for your fancier pieces. 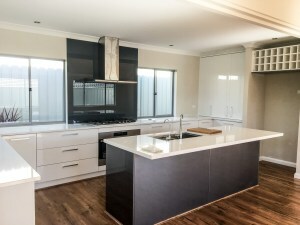 The only factor I would mention here is overall kitchen layout. 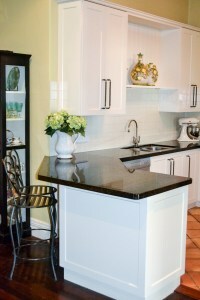 A tight, small, u shape kitchen may lend itself to more open shelf or a limited number of overhead cabinets. This avoids closing up the space. 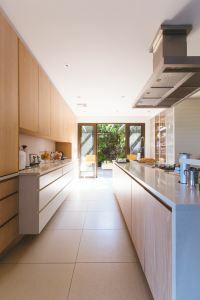 Whereas a largish kitchen a big centre island can get away with a larger amount of overhead cabinets along the back walls. Think about your small appliances and bits and pieces. Now whilst I’m a big fan of keeping things tidy and avoiding clutter, there are a few items you will see out on my kitchen bench permanently. These are a kettle, coffee machine, kitchen aid mixer, fruit bowl and a small basket that holds letters, car keys, wallet etc. Plus I love my cooking, and being a mum of a baby and a toddler means there are many a day where I have three separate meals going at once. 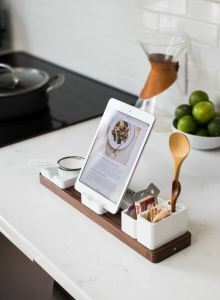 This means I need plenty of space for bowls, chopping boards, ingredients,…. You get the picture. We also like entertaining, so again I need space for all the food and drinks that go with feeding the masses! So, my point here is you need to think about your daily routine with appliances, how much space you need when you cook, and what items you may like out on a permanent basis. Making sure you have enough bench space is a kitchen must have. My final kitchen must have is plenty of power points. In a way, this point (another pun!!) flows on from the last. When considering your appliances and the kitchen being in full swing, I believe you can never have too many! Think about it, a Kettle, a coffee machine, toaster, mixer. Then you might have a phone on charge on the side. 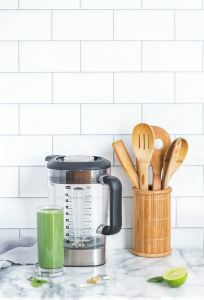 Make sure there are some near the hot plate just in case you want to use a stick blender in a pot of soup, and some in your island bench too if possible. A small detail that often gets overlooked, but makes a huge difference come cooking time. 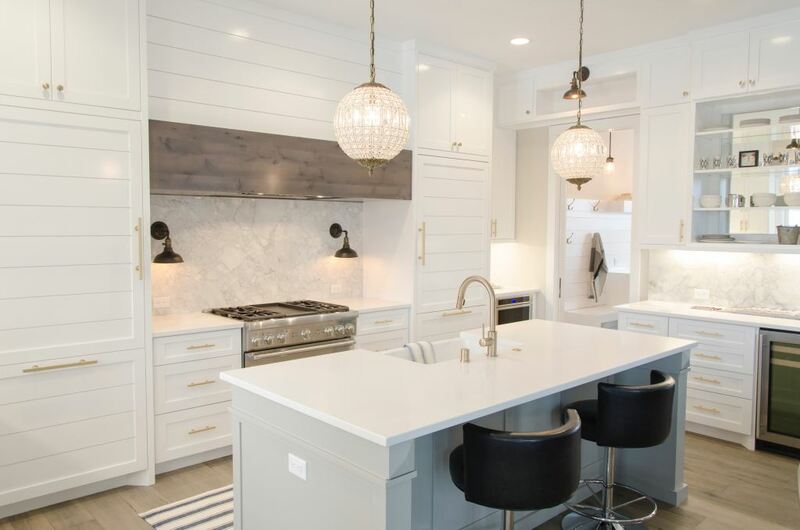 So, there you have it, a few factors to consider before you start designing the layout of your next kitchen! 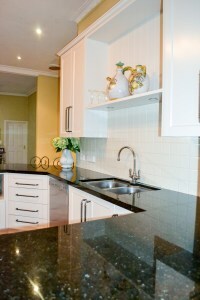 If you have any other features that you think are ‘kitchen must haves’, Id love to hear about it!